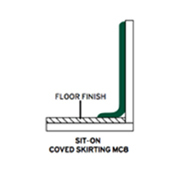 Feather Edge skirting or Flat Edge skirting are fitted after the flooring has been laid, and can therefore be used to replace an old skirting, as well as to provide a neat finish to a new floor. These tough and durable skirtings give protection to the wall decorations at floor level. Where ease of maintenance and hygiene are important, sheet flooring may be taken up the wall, having created a radius using our Coving Fillet. 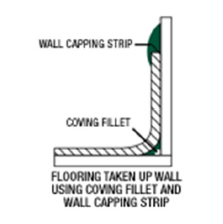 Wall Capping Strip gives a neat finish to the installation and ensures a continuous, sealed surface. 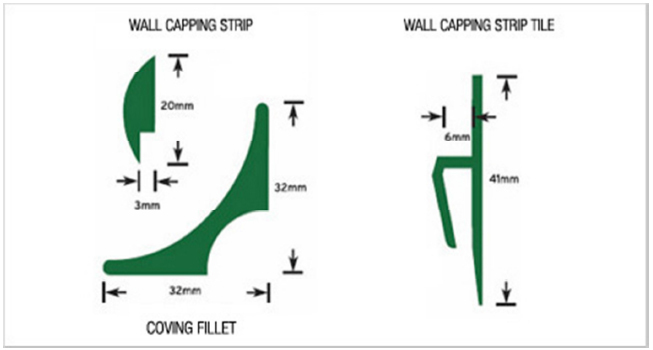 The Wall Capping Strip comes in two types, one as a neat finish to the wall and the other to accommodate ceramic wall tiles. Please look at the graphic below to see available sizes.